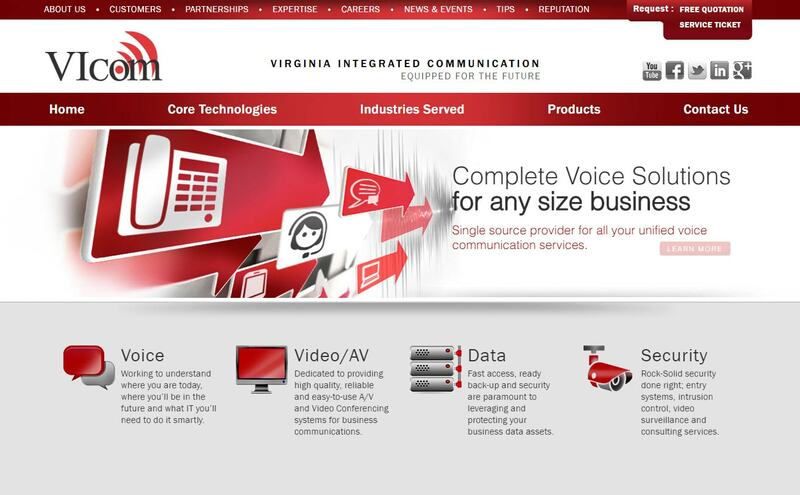 Web Design IT Technology companies Hampton Roads | VIcom Corporation is a IT services and products provider with offices in Virginia Beach and Richmond, VA. This custom Word Press website is mobile friendly and features advanced home page sliders and rich content articles. The website header features drop down forms that slide down as an overlay for easy customer access. The top navigation area contains the administrative pages and are separated from the main services pages. TIP: It is important to keep your administrative or soft navigation tabs separated from your primary nuts-and-bolts navigation tabs. Make it easy for visitors to quickly find they are looking for. At VISIONEFX there are no plug-in-play Word Press or Joomla templates.. We feel every website should reflect the look, feel, style and branding of the online business. This is why VIcom chose to have a unique custom Word Press design and is the 3rd website redesign for VIcom since becoming a VISIONEFX client many years ago. Call the web design technology experts for Web Design IT Computer Services Companies. 757-619-6456 or email direct to info@visionefx.net.